The first OFFICIAL Video Game of Bud Spencer and Terence Hill! We have already written an original story that pays homage to all the most famous films of Bud Spencer and Terence Hill, characterizing them with the style of the 80's Arcade. The idea is to build something by the Fans and for the Fans so we can all continue to have fun with the adventures of Bud and Terence for quite a while and make them somehow eternal. Hey listen! 50% in a partnership means we both make the decisions!” “You’re interested in than?” “Who me? No!”: In Slaps And Beans we must not only defeat enemies. At times it will be necessary to use the specific skills of the protagonists (like the agility of Terence and the strength of Bud) to overcome obstacles and proceed in the history. “Hey you can't miss this one, Chief! Live from your reporter: I go down, he starts swinging. I'll duck. He doesn't see the tree and hits it head on.”: Slaps And Beans is a scrolling beat’em up but, compared to the classic fighting games, it will have an advanced fighting system targeted to get fight choreography as faithful as possible to the fistfights of Bud and Terence. “How about a beer and hot dog contest?”: Often our heroes will face some minigames to unlock progress in the game. An ever-present challenge will be the beer and hot dog contest! “Oh by the way, do not forget, not just any Dune Buggy, it gotta be red with the yellow tarp”: Yes, you can also ride the Dune Buggy! Expect great things from her in the game! ..... And the surprises do not end there! The story will take place on different locations to revive atmospheres and quotes (many quotes!) typical of the films. The game levels will be distributed in a Miami 80s, a tropical island and a western scenario. We have been working as video games developers for several years and, finally, a year ago we decided to create a small free demo of the game of our dreams: “Schiaffi&Fagioli” (downloadable from here). The amount of positive feedback gathered for a project so small and developed quickly and without a budget, has given us confirmation of what we already knew in our hearts: the world NEEDS a true video game of Bud Spencer and Terence Hill. And we need you to make it happen! Fra Cuphead & questo direi che è l'anno degli Indie! ma io solo ora ho scoperto questa meraviglia? DEVO VERGOGNARMI. Bud Spencer & Terence Hill - Slaps And Beans has been Greenlit and is now listed in the Steam store. 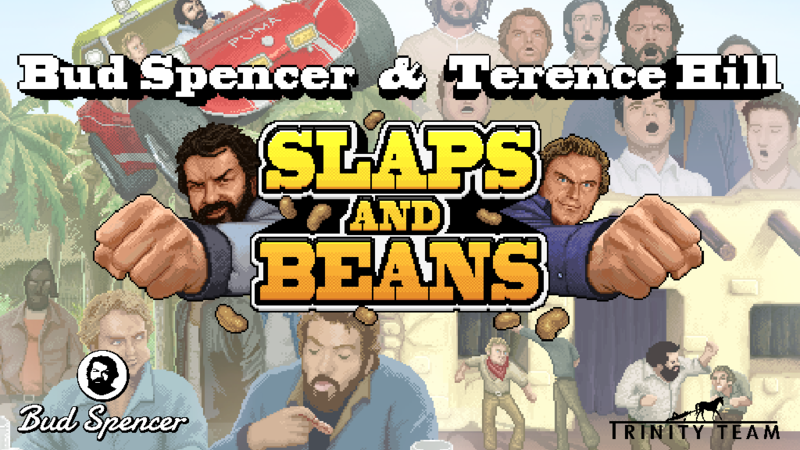 For the latest information, purchase options, and discussions for Bud Spencer & Terence Hill - Slaps And Beans, please see it on the Steam Store or in the Steam Community.